Ever since coinage was developed in ancient Lydia, an element of society has sought to debase the coin of the realm for personal gain not only by counterfeiting, but also by shaving away precious metal. Currency debasement was not confined to the proletariat since throughout history various monarchs increased their royal revenues, or seigniorage, by reducing the quality of the coins’ specie content or its weight standard. The current text follows closely the course of royal English copper coinages whose high potential profit made them an ideal prey for counterfeiters. These forgeries flowed freely into the colonies where they overwhelmed, and eventually collapsed, the small change medium but not before various states sought to correct the evil of this imported copper trash. Great attention is paid to Great Britain’s mercantilistic policies which shaped the character of the currency in the North American colonies where chronic hard money shortages encouraged counterfeit coinages of all stripes whose actual manufacture and circulation is examined in great detail. Colonists further sought to expand their monetary pool by printing bills of credit to meet the exigencies of the French and Indian Wars. 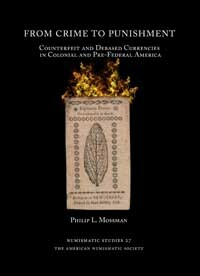 This new paper currency likewise became the target for forgery and a battle royal ensued between the colonial treasurers and bands of counterfeiters as they competed to outsmart each other. But as “the weed of crime bears bitter fruit,” many counterfeiters were apprehended and punished for their evil deeds.